The second day of the week-long Kadayawan sa Dabaw festival celebration highlighted the culture of the indigenous peoples in the opening of the “Tribuhanong Pasundayag” (cultural show) on Tuesday, August 16. A Muslim leader here said that schools should integrate the indigenous games in the curriculum. 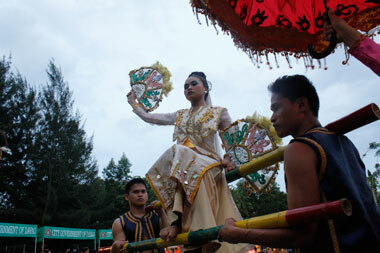 Five more days left before the Kadayawan festival. Check out this list of activities for the week-long celebration. Contend​ing groups from other provinces will be required to show a variety of ​festivals from their regions during the Indak-Indak sa Kadalanan. Emmanuel Babao, head of the Pamulak Festival, said they are still accepting contingents to join the Pamulak sa Kadayawan on Sunday, August 21. It will be held from Magsaysay Park to San Pedro Square. One of the major events on the past years of Kadayawan, the “Sayaw Mindanaw” was being adopted now by the private sector in the upcoming festival this month. Law enforcers here will institute tighter security measures for the upcoming Kadayawan festival as a police official confirmed the attendance of President Rodrigo Duterte to the annual celebration. Filipino actress Jodi Sta. Maria visited the indigenous people evacuees housed inside the United Church of Christ in the Philippines Haran compound on Tuesday, July 19.